I love my Iron Man pajamas. In three weeks, I will start seminary. ¬†In three weeks, my budget and my financial planning will be torn to shreds. ¬†But I refuse my financial discipline to be as damaged as it was when I went to university as an undergrad. ¬†I want to know how much seminary really costs me. I want to keep track of EVERYTHING. And I need to share. Every school year begins not with registering for classes, paying the tuition bill, or waiving health insurance. Oh no. ¬†The school year officially begins when you start buying new clothes. BOOYAH! I am really excited about this part. So far, I bought new shoes, one new vest-hoodie from Forever 21, and something from wal-mart. ¬†I will share my wal-mart purchase with you because it is the greatest. 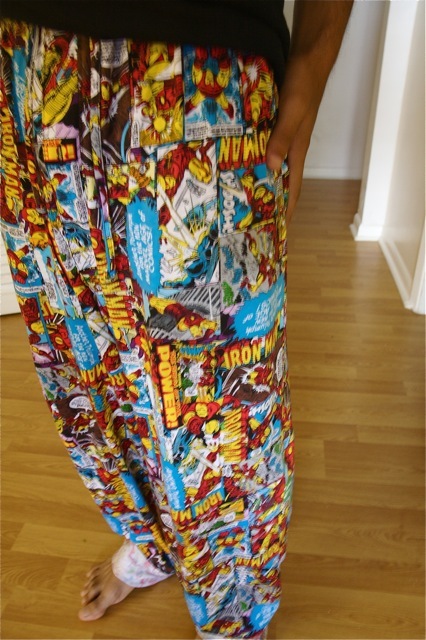 ¬†I give you my Iron Man Pajama bottoms. The amazing thing is that I use to own everyone of the comics depicted on the pants. From Iron Man Submariner #1 (from 1968) to earlier Tales of Suspense issues and through the picture frame covers from the late early 70s. I loved those issues. The stories are ridiculous, the writing dated, but the art was just fantastic. ¬†K found this for me yesterday and I’ve been wanting to wear them outside every day. ¬†I, however, won’t because I also refuse to be the grad student who wears his pjs to class. ¬†What would Stacey and Clinton say? So, so far, my clothing cost is currently at $72.94. ¬†My first book for my intensive course (Shopping Malls and Other Sacred Spaces by Jon Pahl)¬†cost $28.16 . ¬†Total seminary expenses : $101.10. ¬†That will go up. Dude sweet pair of pajamas, almost looks like I’m reading the comic strip.